*Optional ingredients are not included in nutrition calculations. In a small mixing bowl, stir together the dry rub ingredients. Pat the pork dry with paper towels, and cut the loin into 3-4 large pieces. That will speed up cooking time and make the pork more manageable to shred. Pour the dry rub onto a baking sheet or large bowl, and coat the pork in it, making sure to cover all sides. Place the pork in the slow cooker and pour in the apple cider vinegar and apple juice. Cover and cook on low for 6-8 hours or on high for 4-6 hours, or until the pork is fork-tender. Using tongs, remove the cooked pork from the slow cooker onto a cutting board or baking sheet and shred with two forks. Place a fine mesh strainer over a large mixing bowl and pour the liquid out of the slow cooker; do not discard. 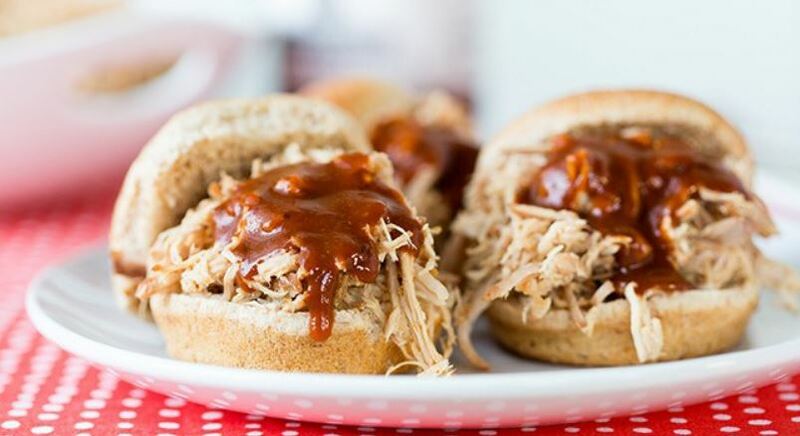 Place the shredded pork back into the slow cooker with ¼ cup-½ cup of the reserved cooking liquid. Serve with an optional bun and Stubb’s® Original All-Natural Bar-B-Q Sauce, as desired.